During the cold season, the flu is undesirable #1! Help curb the spread of sickness in your home by targeting your most touched surfaces! - Every time you enter/exit your home or any individual room, chances are that you're touching a door knob and/or turning a lock. Any surface that you're touching constantly, without having just washed your hands, is a perfect breeding ground for germs. - Unless you can "clap on! clap off! ", light switches are some of the most touch heavy surfaces in your home. - Not only do these surfaces accumulate germs, they also have a tendency to accumulate sticky, greasy debris due to their locations in kitchens & bathrooms. - Just think: you touch the flusher before you wash your hands, after doing your business. - You also touch the faucet handle in the bathroom before you wash your hands... and then again afterward. If they aren't cleaned, touching them feeds into a cycle of hand contamination. - Cleaning these will help to prevent soap scum buildup and the transference of germs, especially if you don't wash your hands thoroughly afterward. Also, if you pump out soap for children, an unclean pump will dirty your hands. - An everyday scenario: touch your phone, scratch an itch, touch your phone, eat, touch your phone, take out the garbage, touch your phone, shield a sneeze, touch your phone, blow your nose, and touch your phone again! Enough said. - This category includes desktops, laptops, and tablets. That means that not only are these items potentially dirty from activities inside the home, but also have the ability to track in outside germs. - If you've ever cleaned these before, I'll be thoroughly impressed! On television, I've seen people scratch with these items. If life imitates art, please clean these regularly & thoroughly! **Do not spray cleaning solutions directly onto surfaces! ** Dampen cleaning towels with solutions to prevent dripping/liquid damage. Using a neutral and clear colored liquid dish soap, squeeze a few droplets into 1/4 of a pail of warm water, to create the perfect cleaning solution. Use a multi-surface disinfectant liquid cleaner. Search for labels that advertise a 99.9% kill rate of bacteria that includes Salmonella, E.Coli, and certain strains of Influenza. Several items also contain a non-astringent odor eater to freshen the home without harsh fumes. Spray the polish directly onto a lint-free towel, then wipe the surface and enjoy a powder free, smudge free finish. BUY NOW: 2 PACK, $14.98! Ask Cindy's Premium Terry Cloth Towels! 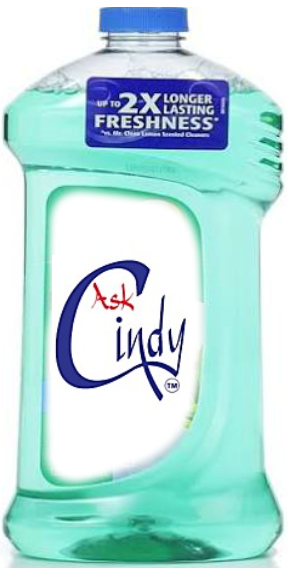 Let’s Clean House with Cindy!